America needs to stay healthy this flu season. Since late last year, flu cases have been rising, causing deaths since September last year. The virus has spread in 48 states, affecting mostly children and senior citizens. Although flu vaccines are available, the Centers for Disease Control and Prevention (CDC) sadly announces that these vaccines are only 23 percent effective. Nevertheless, CDC still encourages the public to receive the vaccines, as having some form of protection is better than none at all. Almost all people are familiar with the symptoms of flu (influenza). If you have it, you may suffer from runny or stuffy nose, cough, sore throat, headache and fever. However, fever may not be present in all flu cases. Other signs and symptoms include chills, body aches, fatigue and occasionally, vomiting and diarrhea. One of the most common ways of transmission of the flu virus (or of any viral disease) is through the hands. Once germs and viruses stick to the hands, it is very easy for it to enter our body. Ideally, it is best to wash hands with soap and water. However, if these are not available, alcohol or hand sanitizer will do. The easiest route of entry for viruses is through the nose, eyes and mouth. If your hands are contaminated, germs and viruses can quickly enter when you rub your eyes, eat with your hands or touch your nose. One way to strengthen the immune system is by getting enough sleep. 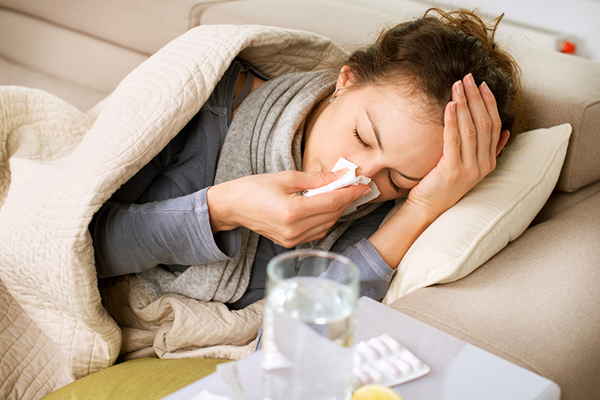 By having a strong immune system, we can better protect our body from sickness such as flu. Another way to boost the immune system is by exercising regularly. Aside from strengthening the immune system, regular exercise can also lower the body mass index (BMI). Since a higher BMI is associated with increase in illness and injury, exercise proves more useful than just lowering your body weight. If you have respiratory allergies, avoid factors that can trigger it. The presence of an allergy means that your respiratory structures are inflamed. In this state, it is very easy for the virus to invade your respiratory system. Flu often spread in school classrooms, offices and in homes. To prevent the virus from contaminating almost everything in your environment, always clean and sanitize your area. For instance, the virus can spread in doorknobs, light switches, photocopying machine, telephone, fax and even the candy bowl. Once you are sick, avoid contact with others to avoid spreading the virus. Stay at home for 24 hours. Do not go to school or work so workers will not contract the disease. Wear a facial mask to prevent fluid droplets from spreading in your surroundings. Throw away used tissues promptly. Get enough rest, eat nutritious foods and take vitamin C supplements to help the body recover from flu faster.